We make traditional handcrafted wines, using open fermenters and basket presses in the most natural way possible. By 1985, Clos Malverne had been supplying its wine grapes to Stellenbosch Farmers’ Winery for a number of years, when Jeremy Walker, now of Grangehurst farm, suggested to Seymour at a braai on Christmas Eve that they make wine from Clos Malverne’s grapes. Therefore, 800 bottles of Cabernet Sauvignon were made in 1986, and the 1987 vintage was so encouraging, that Seymour decided to go into winemaking full time. The Cabernet Sauvignon ’88 was the first release to the public, and a year later Jeremy Walker joined Seymour as full-time winemaker. During the 90’s Clos Malverne made significant inroads into the wine business, increased its vineyard plantations, which included Pinotage for the first time. Other red varietals, including Merlot and Shiraz, were also planted on selected sites with specific soil compositions to ensure the growth of premium grapes. In 1995 Clos Malverne was one of the very first wineries to produce a classic Cape Blend (a red wine consisting of at least 30% Pinotage, but not more than 70%). The wine was such a success that the flagship wine, called the Clos Malverne Auret, was changed from a Cabernet Sauvignon / Merlot Bordeaux style blend to a Cape Blend (Cabernet Sauvignon / Pinotage). The Auret 1998 vintage was the first Cape Blend ever to receive 5-star status in the prestigious Platter Wine Guide. After receiving such high praise, the same wine went on to be the South African Red Wine Champion in 2001; it was eventually awarded the Grand Prize as most outstanding wine (red or white) of that year. Clos Malverne is truly a family affair. 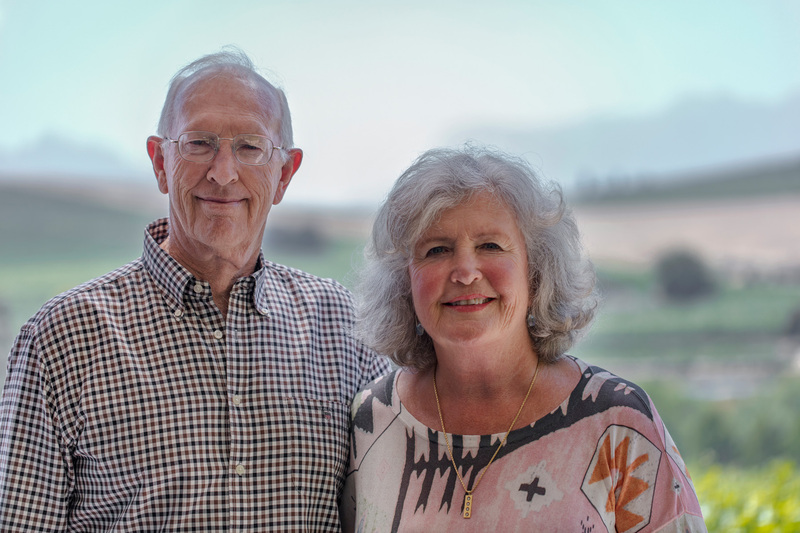 Besides overseeing the entire operation, Seymour and his wife Sophia (who also attends to the accounting), have spent enormous time and effort successfully developing international markets for Clos Malverne. At present about 70% of their wines are exported to various international destinations, including the United Kingdom; Ireland; The Netherlands; Germany; Switzerland; the USA; Asia and more. Seymour’s daughter, Belinda Pritchard-Quickelberge, makes sure that Clos Malverne’s visitors are well looked after and pampered at the day spa, also situated on the estate. Even Seymour’s mother has a role to play, if in name only. Auret, the flagship wine of the range, is her maiden name, and Seymour’s middle name. Our story is indeed one of family; vision and commitment to the handcrafting of excellent wines. Shrouded in the misty veils of the Devon Valley, lies the 27 hectares that is Clos Malverne’s premises. The Devon Valley microclimate is the key to the quality of the grapes grown in this serene environment. Although the valley is shallow it acts as a natural receptacle for the mists that linger around Stellenbosch in the early morning hours of summer. The valley is cooler than surrounding areas, significantly lengthening the ripening season, resulting in grapes of ideal ripeness. The vineyards reside on the gentle slopes of the valley to ensure the most favourable exposure to sunshine. Clos Malverne’s vineyards are located on two separate properties in near vicinity of one another, each selected by degree of varietal affinity to the particular soil type. Dwars-in-die- Weg has 11 hectares under vine, Cabernet Sauvignon; Merlot; Shiraz and Sauvignon Blanc. All vines are drip irrigated using water from the farm dam. Clos Malverne’s 12 hectares of vineyards, which include plantings of Pinotage; Merlot; Cabernet Sauvignon and Shiraz also makes use of drip irrigation. Clos Malverne practices a careful “handmade” style of winemaking, with minimum interference by the winemaking staff, resulting in elegant wines, which are expressive of their terroir. We are one of only a handful of wineries in the world that remain true to the traditional and time-honoured way of using a Basket Press. Basket pressing is one of the oldest methods of pressing grapes; the Ancient Greeks and Romans developed it, later perfected by the French, Basket presses were one of the earliest styles of a mechanical press, and using a basket press means that it is extremely time consuming the results are soft, elegant wines of great complexity. Open fermenting cement “kuipe” are also used and their grape-skin caps are punched-down by hand. The cellar can effectively manage the crush and vinification of up to 400 tons of grapes, although the yields from the vineyards are presently producing at 350 tons per annum. Small French and American oak casks are used to mature the premium red wines.